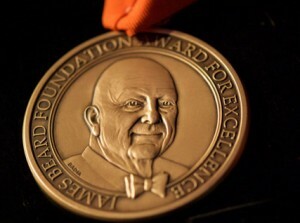 It’s that time of year again—the countdown to May and the annual James Beard Foundation Awards. The James Beard Foundation announced the nominees on their blog today. The semifinalists for their Restaurant and Chef Awards include a number of Chicago-area chefs and restaurants. Judges from across the country will take a look at the list and vote to narrow it down to a final list of nominees. The Foundation will be live tweeting the nominee announcement on March 21, but in the meantime you can check to see if your favorite Chicago chefs and restaurants are listed and visit the JBF Blog for the full list from around the country. DineWise Chicago is written by Cindy Kurman Barrie and Lee Barrie, the principals of Kurman Communications, Inc., a Chicago-based marketing and public relations agency. The DineWise column appears weekly in Streetwise magazine. Please visit their blog at www.gotbuzzatkurman.com and check out all DineWise articles at www.dinewisechicago.com.